For a relatively small country, Czech Republic produces an inordinate amount of beautiful women. The national high-carb diet and rivers flowing the beer must not really be the health hazards we are led to believe. Czech women get consistent recognition on the world stage by winning beauty contests and becoming very multi-faceted supermodels. We investigated the top Czech supermodels and even ranked them for your amusement and debate, accompanied by memorable monikers (surely a Pulitzer-winning effort if there ever was one). Karolína was born in 1984, and is best known as one of the Victoria’s Secret angels. She has also modeled for such fashion giants as Yves Saint Laurent, Tommy Hilfiger, Valentino, Louis Vuitton, John Galliano, Chanel, Dior, Hugo Boss, Jean Paul Gaultier, MaxMara, Bottega Veneta,Versace and H&M. But perhaps more interestingly, just this February she appeared on the hit sitcom 30 Rock, has a star on the Hollywood Walk of Fame, and has no navel, due to a childhood operation. She currently lives in NYC, while continuing her reign as one of the top-earning models in the world, working with various charities and going insane at Knicks games with her filmmaker husband Archie Drury. Eva was born in 1973 and was recently in the news when some hard-boiled reporters connected her to the demise of the Italian cruiseship Costa Concordia. Apparently, Eva doomed the ship to bad luck, when she failed to break the traditional Champagne bottle against its hull during the launch in 2006. Such is the power of a beautiful woman. Otherwise, Eva is famous for a being the face and body of the WonderBra campaign, the poster from which was recently voted as the most iconic outdoor ad ever in the UK, as well as selected as one of the top posters of the century and exhibited in a London museum. She was also a spokeswoman for Guess?, appeared on countless magazine covers and modeled the world’s top brands in print ads and runway shows. She also appeared several times in Sports Illustrated, was briefly married to a Bon Jovi drummer, and appeared in a film with Gerard Depardieu. Earlier this year, she did a Marie Claire (Spain) shoot and has been seen working on an Italian film. She has two children with her longtime Turinese entrepreneur beau Gregorio Marsiaj. Petra was born in 1979 and is one of a number of Czech reasons the Sports Illustrated swimsuit issue has become such an iconic institution. She appeared in the magazine for 5 memorable years, but is also famous for being featured in campaigns for Benetton, Cartier, Hewlett Packard, Max Factor, Pantene, and Victoria’s Secret, among numerous others. She has graced the covers of international publications like Elle, Cosmopolitan, FHM and Glamour. She speaks 6 languages and in 2004 happened to be in Thailand when the infamous tsunami that claimed thousands of lives struck. Petra’s fiancé at the time perished while she survived by barely clinging to a palm tree for hours as the waters rushed by. Courageously overcoming her harrowing experience, she founded The Happy Hearts Fund, a non-profit that helps rebuild the lives of children after natural disasters. In 2011, Petra was appointed as Honorary Consul from the Czech Republic to Haiti by the government of Haiti. She is married to the British actor Jamie Belman. Born in 1987, Taťána is probably the most famous new face to come out of CR. In 2006, while still in high school, she won the Miss World competition, becoming the first Czech woman to ever do so, while also being the youngest winner in Miss World’s history. The sky is the limit for Taťána as she has been recently doing an increasing amount of magazine covers and photo shoots and is sure to have a remarkable career. She also has a foundation called “The Beauty of Help” that helps disadvantaged individuals like the elderly or youth in halfway houses. Recent gossip has her dating the American model Lane Carlsson. Born in 1970, Daniela became known as “The Chameleon” for her ability to change her looks. She appeared in Sports Illustrated what must be a record ten times, while making the cover on three occasions. She was the spokesperson for L’Oreal, modeled for Victoria’s Secret, and made the covers of seemingly hundreds of worldwide mags like GQ, Cosmo, Elle, Marie Clair and Glamour. She speaks 5 languages and currently lives in Prague, representing Avon Cosmetics. She has three children (two with her current boyfriend, the Slovak singer Pavol Habera). Tereza was born in 1971, and is famous for modeling for such top brands as Dior, Chanel, Prada, Gucci, Versace, Yves Saint Laurent, Ralph Lauren, Karl Lagerfeld, Donna Karan, Hermes, and L’Oreal. She is also beloved for her successful foundation, which helps over 24,000 children growing up in institutional care in the Czech Republic ( http://www.terezamaxovadetem.cz/en/). She models rarely these days and by all accounts has moved to Monaco with her Turkish businessman boyfriend Oymenem Burak. Prince Albert is apparently a friend of the glamorous couple. Paulina was born in 1965 and had in many ways paved the way to international success for other Czech models. 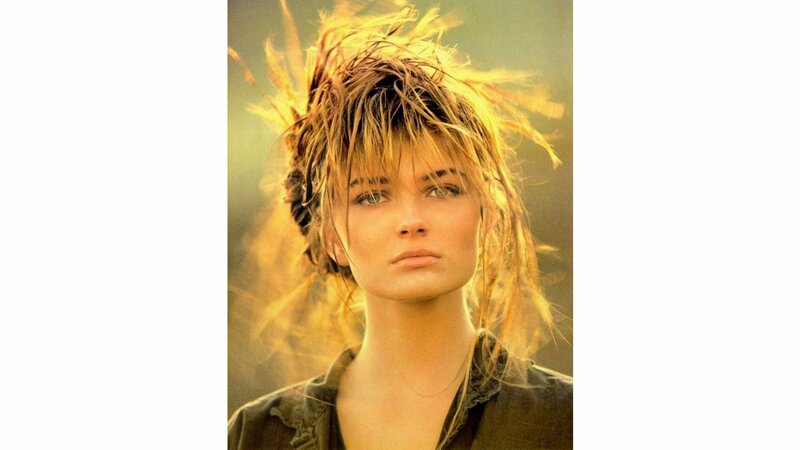 She was the highest paid model in the world in 1988 for her contract with Estee Lauder. She made countless magazine covers, including (yet again on this list) the Sports Illustrated swimsuit issue (the first Central European woman to do so). As her modeling career winded down, she took advantage of her other gifts. Paulina is a great conversationalist, and appeared on a number of TV shows, including “Dancing with the Stars” and “America’s Next Top Model”. She actually once turned out the role of a Bond girl because she had better things to do. She also wrote a children book and a novel, the band No Doubt wrote a song about her, and perhaps in most interesting musical news, Paulina married Ric Ocasek from the band The Cars. While surely a great guy, Ric is not known for his model looks. Helena was born in 1979, and is known for her work in countless fashion magazines and for donating almost all her earnings to charities for orphans and disadvantaged children. This fact led to her being nicknamed the “Czech Princess Diana”. A Miss Czech Republic of 1999, Helena was featured in ad campaigns for Gap, Yves Saint-Laurent, Victoria’s Secret, Tommy Hilfiger, Revlon, Dolce & Gabbana, and Louis Vuitton among others. She is married to an American businessman and film producer Omar Amanat (with whom she has two boys). She is an outspoken vegetarian, campaigning for animal rights, especially against fur use. Hana was born in 1985 and is one of the most active models working in the industry. She was featured in over 80 magazine covers (like Vogue, Elle, Allure, W), has over 4000 pages of fashion stories and ad campaigns show her work, and did over 500 runway shows (like Victoria’s Secret). She has worked with numerous famous brands and fashion world icons like Alexander McQueen, Zac Posen, Gucci, Galliano, Dior, Karl Lagerfeld, Valentino and Calvin Klein. She even made it into a recent episode of the TV show “Gossip Girl”. She lives in NYC where she and her American industrialist husband Drew Aaron are known as top art collectors. Like her Czech model colleagues, Veronika was a regular of the Sports Illustrated Swimsuit issue (appearing there 8 times). Born in 1977, she has been photographed by some of the world’s best in campaigns for Chanel, Gap, Guess, Pantene, Escada, and Victoria’s Secret. She was the face of Nivea. She has lived in NYC for a big part of her life and appeared on a number of American talk shows. In 2008, she climbed Mount Kilimanjaro, a trip during which she discovered her passion for protecting African wildlife. This has led to her ongoing philanthropic involvement in that cause. She used to be married to the famous NHL hockey player Petr Nedved, and her most recent romance appears to be with the Brazilian tycoon Eike Batista. Does Location Influence Personal Style?